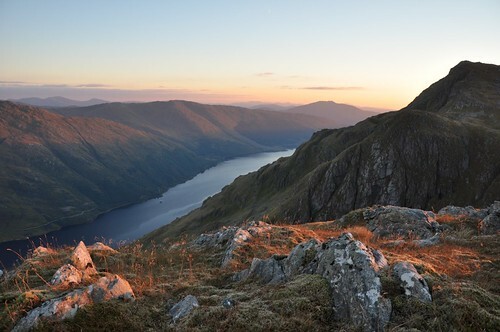 An overnighter above Loch Shiel. It was a long drive west compounded by an early diversion at Oldmeldrum, fog around Aviemore and then a further diversion at Newtonmore which took me to the far side of Laggan. It was early afternoon by the time I’d parked up at the railway crossing at NM856813, about 4km past Glenfinnan station. 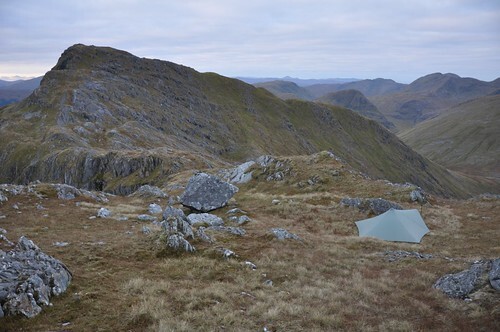 Still I was not in any rush, I’d decided to split the walk into two and enjoy a high camp. 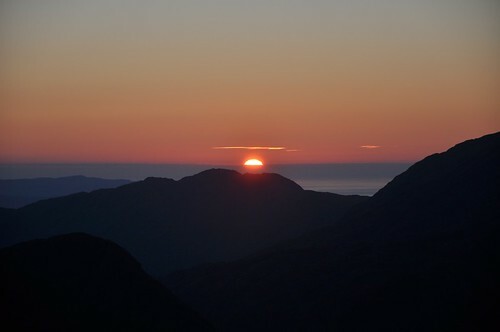 The weather was as forecast so far, plenty of sun and very light winds, it was supposed to continue this way into Sunday! 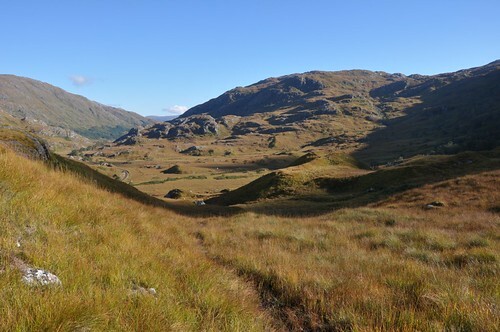 The railway crossing point also fords Allt Lon a’ Mhuidhe and leads onto the edge of a boggy meadow. 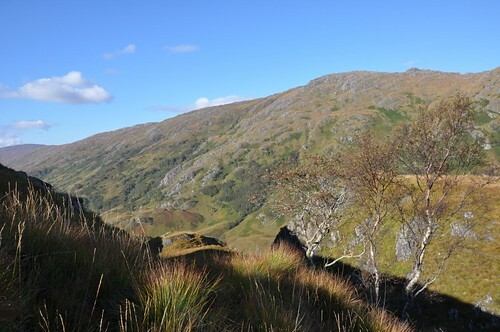 There was a path of sorts rounding a grassy knoll before starting up the hillside in the direction of a nick in the ridge, just above Creag Bhan. 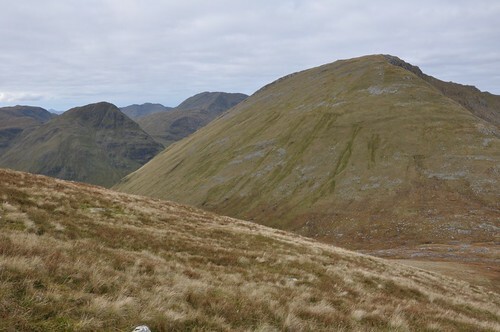 A developing gorge had me divert from the side of the burn for a while but I was soon approaching the ridge line to be greeted with a view across to Beinn Mhic Cedidh. 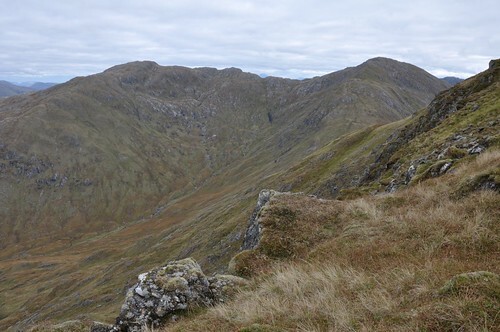 It was then a steady climb up a wide ridge picking a way easily around the knobbly bits to eventually gain the top of Beinn Odhar Mhor. 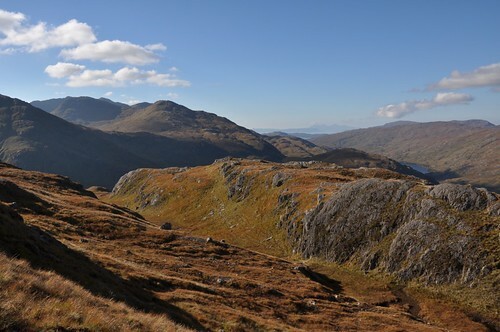 There were some nice views west toward Beinn Odhar Bheag and the Lochailort Pyramids and back the other way down along Loch Shiel to Glenfinnan and the hills beyond, notably the ridge line of the Streap. 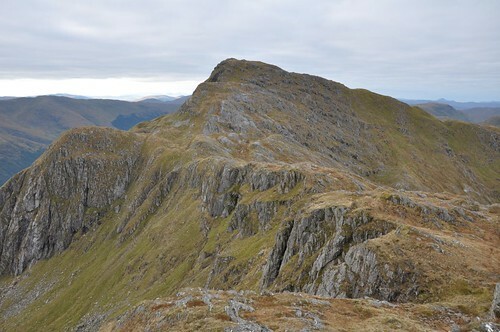 After dropping down the side of a few crags I noted some nice places to pitch the tent but decided to go on at least a little further. 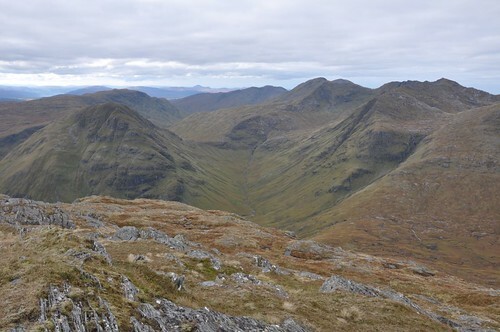 I was thinking about continuing onto Beinn Odhar Bheag but in the end picked a nice spot above Sgurr an lubhair, a spur that split’s Beinn Odhar’s deep eastern corries Coire na Lotha and Coire nan Clach. 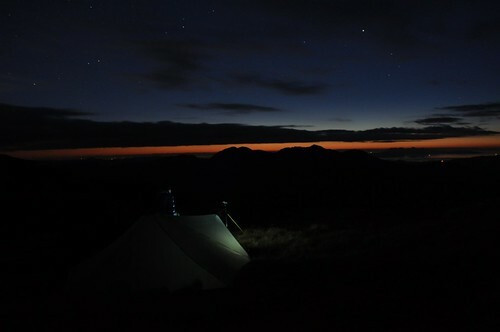 Camp was soon set and with a brew in hand it was time to kick back, relax and enjoy my surrounds. I wandered out along the southeast spur for a closer view of Sgurr Ghuibhsachain, Sgurr Croabh a' Chaorain and along the length of Loch Shiel toward Beinn Resipol. There was no spectacular sunset but as the sun dipped out of sight a narrow band of orange and red illuminated the horizon for quite some time. 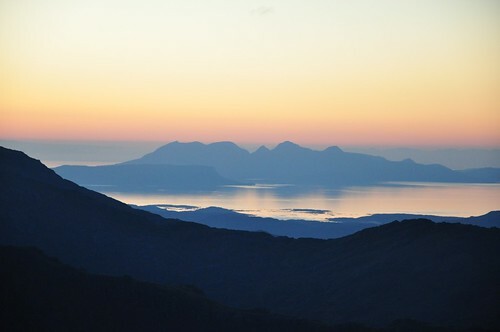 The island of Rum seemed to float above a milky sea. A crescent moon shone amongst a million stars above Beinn Odhar Bheag. I had a go at taking some night time photos but aware that my camera battery was running low had to cut the exercise short, still some practice needed here! It clouded over during the night and while this meant it was a warmer night than expected it was a disappointingly grey start to the following day. Nevertheless, I took plenty of time over breakfast taking in views and with the Isle of Mull swathed in sunlight, there was always a little hope that conditions would brighten. 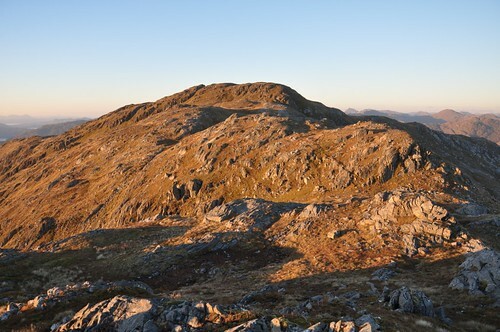 At 10am I decided to break camp and began my way along the top of some rocky buttresses to the start of the final short pull onto the top of Beinn Odhar Bheag. I’d assumed the rough barking noise coming from down in the corrie was from a stag being so deep in resonance but on closer inspection I discovered it was actually a hind. 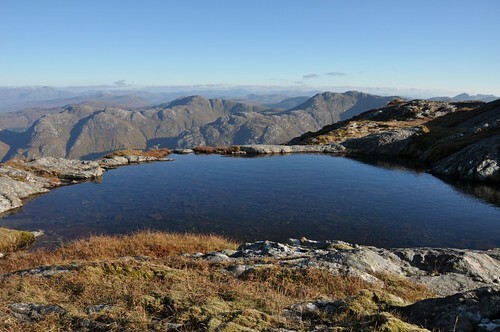 The top of Beinn Odhar Bheag is certainly a fine viewpoint and I took some time before beginning the long descent to Bealach a' Choire Bhuidhe. 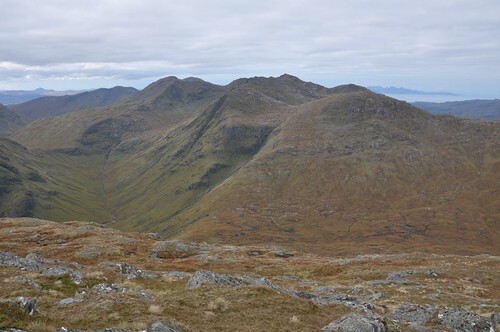 Croit Beinn now started to take prominence together with the fine ridge of An t Slat-bheinn and its connecting hills Sgurr Na Ba Glaise and Rois-Bheinn. 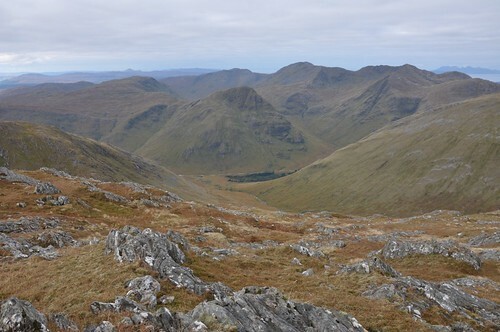 I paused for a while as a steady stream of hinds strolled across the bealach, while many more could be seen on the upper western slopes of Beinn Mhic Cedidh. The grassy slopes up to the top were obstacle free but turned out to be slightly steeper than expected. At the top it was time for lunch so the stove was soon out in preparation. The walking along the rocky north ridge was easier than expected before making a turn lower down over boggy ground that had me slip sliding along on a couple of occasions. 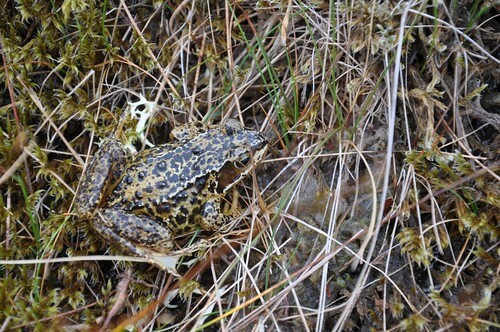 Some of the resident wildlife on this part of the hill were perfectly at home in the dampness. 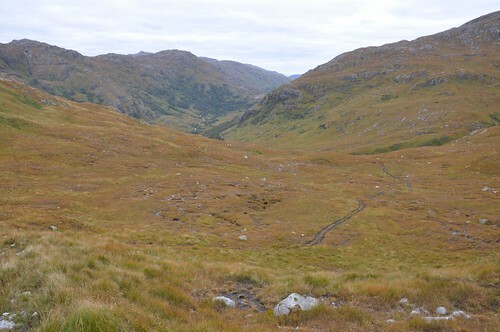 The grassy slopes lead down to the bealach below Sgurr na Paite at which point I picked up a very muddy ATV track leading down into corrie and onto the unmarked bridge over the Allt a' Choire Bhuidhe. Walking down the centre of the track helped a little, the longer grass helping to keep me from sinking into the gooey stuff too much. The way eventually passes beneath the railway, snaking through some birch woods before connecting with the main road. Fortunately I was able to keep to the verge and behind the barriers on the bends for much of the way although on a couple of occasions I was forced onto the opposite side of the road, unavoidable but quite uncomfortable considering the size and speed of some of the traffic that frequents this road. Back at the van it was time to clean up and get out of rather dirty boots and trousers. A fine round with some excellent views, if Sunday had been like Saturday as forecast it would have been just about perfect, save the muddy walk out.